By Li Xinran Source: Shanghai Daily. 2009-9-18 HUNDREDS of residents in a township in east China's Fujian Province gathered in front of the local government offices yesterday afternoon to protest a factory they believe caused lead poisoning in several children. The demonstration took place in Jiaoyang Township, Shanghang County, after at least four children were found to have excessive lead levels in their blood, Xinhua news agency reported. Villagers charged that the pollution came from the nearby Huaqiang Battery Factory. Officials from Longyan City and Shanghang County governments visited the township yesterday to talk with the villagers but failed to settle the dispute, Xinhua said. The villagers blocked a highway for several hours in the morning, according to the news agency. Because of lead poisoning fears, 136 students were absent from the Central Primary School of Jiaoyang Township yesterday and 140 stayed out of kindergarten. The primary school's headmaster, Zou Chaolin, told Xinhua that even more students were absent on Wednesday. The county government said that among 72 children who had taken blood tests, four exhibited excessive lead levels, or more than 100 micrograms per liter of blood, compared with the normal level of zero to 100mu. The other 68 children recorded levels of 53 to 100mu. The county government has ordered the environmental protection bureau to increase supervision of the plant. The Fujian incident was the fourth such case in China since June, following lead poisonings in the Guangxi Zhuang Autonomous Region and Hunan and Shaanxi provinces that sickened more than 2,000 children and dozens of workers. Among them, over 40 workers at the Huanjiang Steel Plant in Guangxi's Hechi City recently were found to have excessive lead in their blood. Dilapidated environment protection equipment was blamed for the problem. The Huanjiang factory was added to the list of steel plants that needed to be shut down in 2008 because it did not meet environmental standards, according to earlier media reports. Production in the factory has been halted. Shaanxi Province shut down a smelting plant amid public anger over heavy metal discharges by the factory that left 851 children ill last month. Earlier, Hunan Province closed a smelter and detained two of its executives after more than 1,300 local children suffered lead poisoning. Protest against suspected lead pollution continues in E China SHANGHANG, Fujian, Sept. 18 (Xinhua) -- Protest against a battery factory suspected of causing lead pollution in east China continued Friday, as nearly 100 villagers gathered in front of the local government of Jiaoyang Township, Fujian Province. 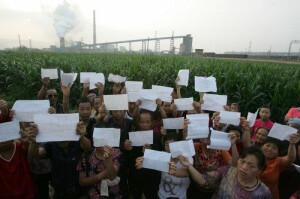 The villagers demanded the Huaqiang Battery Factory move out of the township. The crowd dispersed during the afternoon. Ding Yanzhi, head of the township government, said the factory has been ordered to suspend operation and efforts to clean up the environment around it were under way. In a move to put more pressure on the local government, all the dealers at a local open fair with 192 stalls suspended their businesses Friday. "We want the government to make the factory move out as soon as possible," said one dealer, who requested anonymity. Ding said the local government would organize tests on blood lead levels for all children in the township. Amid fears of lead poisoning, hundreds of children were absent from the local primary school and kindergarten Friday. At least four children in Jiaoyang have been found to have excessive lead levels their blood, which their parents said was a result of pollution from the factory. Officials from the governments of Longyan City and Shanghang County went to the township Thursday to talk with the villagers. But no agreement was reached. The villagers blocked a highway for several hours Thursday morning in a protest aimed at the township government. The county government has ordered its environmental protection bureau to beef up supervision of the plant. The Shanghang County government said Thursday that among 72 children in Jiaoyang who had taken blood tests, four had excessive lead levels -- more than 100 mg a liter of blood, compared with the normal standard of zero to 100 mg a liter. The other 68 children had 53 to 100 mg of lead a liter of blood. Hundreds of students absent from schools amid lead poisoning fears in E China SHANGHANG, Fujian Province, Sept. 17 (Xinhua) -- Hundreds of children were absent from schools amid fears of lead poisoning in Shanghang County, east China's Fujian Province. A total of 136 students were absent from the Central Primary School of Jiaoyang Township Thursday and 140 others from the local kindergarten, the primary school's headmaster Zou Chaolin said more students were absent Wednesday. The county government said that among 72 children who had taken blood tests, four have excessive lead levels in their blood, or more than 100 mg a liter of blood, compared with the normal zero to 100 mg a liter. The other 68 children have 53-100 mg of lead a liter of blood. Residents in Jiaoyang Township said the excessive levels of lead in blood might be caused by a local battery plant. The county government has ordered the environmental protection bureau to beef up supervision on the plant.